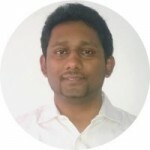 Chandramouli Venkatesan Co Founded Swaas Infosystems along with Anand Natraj. Mouli was an engineer and started off working with Satyam in 2001 till 2008. He met Anand at Satyam. Anand then moved into a pharma company as the CFO and there began the tryst with pharma. Mouli was in the US and Anand mooted the thought that IT in pharma is not mainstream because of the regulatory issues in pharma and they can start with a product to empower the pharma sales teams. Mouli bought the idea and moved into start SwaaS. Since Mouli had experience in Relationship Management, he took up the responsibility of sales while Anand took care of Product Development. Mouli and Anand realized that it was impossible for them to keep researching the market for the perfect product market fit and wanted to hit the market first. They had never sold into the Indian market , but understood that in the B2B space, the best way to campaign would be to get in front of the customers and talk to them on problems they are facing. They hired a sales person who would do a feet on street model and this person initially had set up the meetings and the founders went there went there to understand the customers situation and to sell. Pharma sales force is a huge team with 100s of sales people spread across the Indian market and CRM was not popular. The managers were finding it very difficult to understand what was happening in the market because hand written reports from the sales reps comes once in a while and many reps don’t even send reports. Even though the need was there, there was no similar products in the market and there was no individual who could come there and say that they have done it before. So they picked up a sales person who had sold services in the past and trained him on the business aspects of Pharma and what can be automated. The initial mandate of the sales person is to pitch for meetings with the founding team and they figured out the market together. Mouli recollects him reading the market wrong on the behaviour of very large firms. He had put in lots of efforts on the large Pharma firms hoping that they would have large sales teams and would need the CRM more than the mid sized or the small firms. They had priced the product based on a monthly model which the large pharma companies resisted in adopting. They had their in-house IT teams which built applications based on the sales teams and they wanted a one-time pricing model. Mouli also found that the large companies also wanted customization on their software to suit their process, but SwaaS could not provide customization as they wanted to work on one source code. There was a bit of discussions on changing their models of one source code and recurring revenue which they had decided in the past to get the big pharma clients or stick on to their model and go after the mid-sized and the smaller ones and they chose the latter. He had to let go of a few months of efforts he had put in the large firms and then moved into the mid-sized firms. He was happy that he found a sweet spot where they also had a need but was not keen on buying software and investing in infrastructure but was very open to buying on a monthly recurring pricing model. The customers began coming in and their idea turned into revenue. Mouli , on the decision makers in the companies talks about the training he gives to his sales teams. He tells his sales team not to waste time in Level 2 and Level 3 people but only to focus on the CEO (Top Down approach), who can give them the business and not waste their time and is very clear that their sales people should not meet people who cannot pay. The sales team after some time of practicing this became perfect and began targeting the economic buyers within the organizations thereby reducing the sales cycle. Replicating this model into larger companies was difficult because of various power centres and a sales person needs to handle each one of those but Mouli used the same field force that worked on the smaller companies to focus on larger companies and since the sales force was trained to go to the top, they did not have any mental blocks. They also took a conscious decision of not going after IT departments in mid-sized and in small companies as business was taking most of these calls. So they went to business and their sales cycle again reduced. Mouli also had invested in a cold calling team whose mandate is to fix meetings for the outside sales team who goes and meets the customers. He does not believe too much in marketing as it does not work so much in India in B2B. The senior people were clearly told that any leads that comes out of Inbound leads out of Marketing and Cold calling teams were only a bonus and they cannot wait for the cold callers to give them leads. Mouli taks about the objections that his first few prospects had before giving him the deal. This varied depending on size of companies. He had segmented the market into three categories based on their Buying Behaviour. Companies that were small and had less of bureaucracy with less than 20 crores in revenue and Companies that were large which had all the bureaucracies and power centres which were confusing within also and Companies that were Mid-Sized not very beuracractic but also took a healthy time to close the deal. Whenever an objection on price comes, it almost always is from companies that are small and they explain what goes into making the product for the price than reducing the price. Their rates are largely the same for most of the companies even though it is a bit bigger for the smaller companies because the volumes aren’t high. Sometimes objections also comes on the features and they explain how a particular application is better than the other based on a specific customers’ pain-point in the sales cycle and compare and show them how beneficial it would be for them. In the first customer, what helped them was they used their background in the space even though this application is new. They harped on the point that developing applications was not new to them and they had phenomenal pharma knowledge and the fact that the customers were getting into the safe hands of people who have done implementations of applications which were way to large in size. They established the fact early enough that they did not have customers but the customer is not going to be a scape goat and this positioning helped them to win deals. Mouli says that if someone would go and beg a prospect to buy the application, then they will ask why they should be a scape goat. Their approach was they knew the market needs and based on their previous experience dealing with F500 clients and now this is their company and a crack team is there to solve the problems. Sales is people dealing with people and not people dealing with applications. They showed everyone a full-fledged working demo to build the trust and selling was a bit tough because there were no similar products in the market and they had to convince that they will make it work for them. Mouli’s Advice to early stage startups – Sometimse it may be frustrating but it is important to stay in the game. You have to keep hitting the customers and I would say that first thing that the founders need to focus on would be on sales than on Marketing/PR because awards and recognition gets you only so much but any investor is going to question only revenue and not awards. At SwaaS , the customer is the investor with whom the company can cross and grow with. Everyone should go with that attitude and carpet bombing (cold calling ) works in India very well. You have to force your sales team to meet your customers and it will work. Do little bit of digital marketing but don’t rely too much on marketing. The prospects that goes to google and searches which partner will work with is a small company where they will not have resources to help them find the right vendors but sales will the best if you are looking at mid sized and larger companies to target. Getting on top of google is good but making someone think that I know the team and they will not let me down is much better and that happens through sales. SwaaS has around 90 customers and are servicing around 35000 employees. They raised one round of funding from VCs in 2011. They are also awarded as one of the top 100 companies in Red Herring Asia.